Poet Populist Peter Payack can often be spotted wearing a black leather jacket as he zips down Mass Ave on bike. 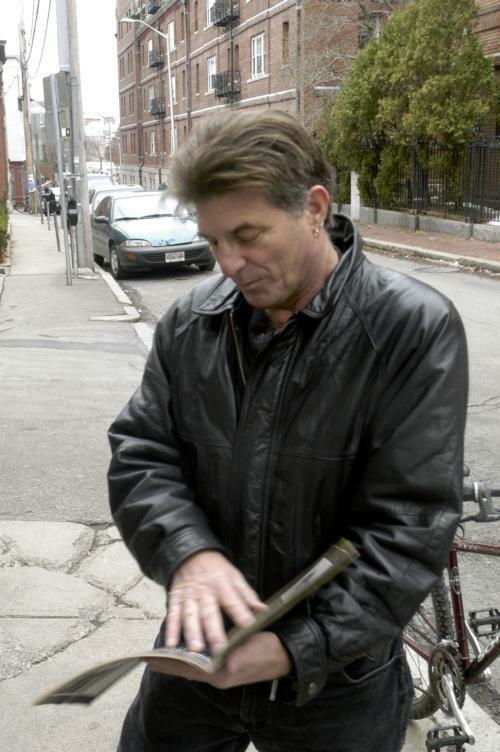 Poet Populist Peter Payack, who can often be spotted wearing a black leather jacket as he zips down Mass Ave on his bicycle, has been spreading poetry across Cambridge for over thirty years. But this fall, the city decided to formalize his role by electing him as its first-ever Poet Populist. Under his new title, Payack is expected to honor poetry and foster an appreciation for it by spreading it to new circles in the community, according to Jason M. Weeks, the executive director of the Cambridge Arts Council and a member of the Poet Populist advisory committee. Payack, an eccentric Cambridge resident who has had over 1,000 of his poems appear in publications including The New York Times and Rolling Stone, has never been the kind of poet to stalk coffeehouses and hide away in the stacks. Payack’s attempts to bring poetry to the community have consistently involved the use of innovative mediums. “I call myself an environmental poet because a lot of my work has to do with the environment that we’re using,” says Payack. Payack, who teaches at several local universities, has initiated a number of efforts to bring poetry into the public sphere—covering Cambrigde’s streets with verse. Payack’s poem “No Free Will in Tomatoes” was sandblasted into the Davis Square subway station in 1980. More recently, Payack was involved with the 2000 Illuminated Words project, which reflected poems off of the walls of public buildings. Payack was also the driving force between the 1976 Phone a Poem program, in which poets were asked to record their work on a cassette tape to which callers could listen. Before the advent of the Internet, “it was the only way that you could get poetry outside of a book or library,” says Payack. Payack has even transferred poetry from formal readings—quite literally—into peoples’ mouths. “I’m a person who’s involved in all areas of city life and I love poetry,” says Payack. Payack, a former marathon runner and an assistant wrestling coach at Cambridge Rindge & Latin School (CRLS), also involves himself in the community by attending local sporting events. Although Payack has already carved a niche out for himself in the community, he can now further his plans to improve Cambridge life in his one-year term as Poet Populist . Square. According to Weeks, close to 1,000 votes were cast. “Someone like Peter Payack, who sort of thinks beyond the convention with very creative ideas of presenting poetry, I think is a kind of person who serves this kind of role very well,” said Daniel J. Wuenschel, manager of Grolier Poetry Book Shop, a local store. The Poet Populist job description, which includes a $1,000 stipend funded by the city of Cambridge, is deliberately ambiguous to accommodate the interests of the individual who is elected, according to Weeks. Over the next year, Payack says that he plans to launch a poetry project at the Longfellow School in Cambridge working with students to write poems and convert them into “wearable art” using a button machine. Yet Payack, a New Jersey native, says it is the city’s “intellectual hiss” that led him to move to Cambridge 35 years ago. He describes an intellectual culture in Cambridge in which “the bar is a little higher” to accept the kinds of programs with which he has been involved. While Payack is Cambridge’s first Poet Populist, the idea originated in Seattle, Wash., the only other U.S. city to boast such a program. “Seattle’s pretty lefty, and populism is a real thing here, and people can get behind that and they know what it means,” says Redmond. After meeting with a colleague in Seattle, Cambridge City Councillor Brian Murphy brought the idea back home, where he raised it with Weeks. In Cambridge too, the program seemed like a good fit, reflecting the city’s artistic culture and liberal political slant, according to Weeks. “I think the councillor liked it because it was very much about keeping with the grassroots nature of Cambridge,” says Weeks. Though the office of the Poet Populist was only introduced to Cambridge last month, the idea of granting public recognition to a poet dates back to antiquity. While Payack may not fit the mold of the classical poet laureate, he says that he has always been enamored with the ancient Greeks and Romans. “The ancient Athenian idea of a cultured and intelligent person was someone who participated in civil life,” says Payack. Payack’s intellectual curiosity has led him over the years to learn and read about ancient philosophy and modern science—knowledge he incorporates into his work today. “I try to put them all together and make the Payack version of the Universe,” he says. —Staff writer Lindsay P. Tanne can be reached at ltanne@fas.harvard.edu.